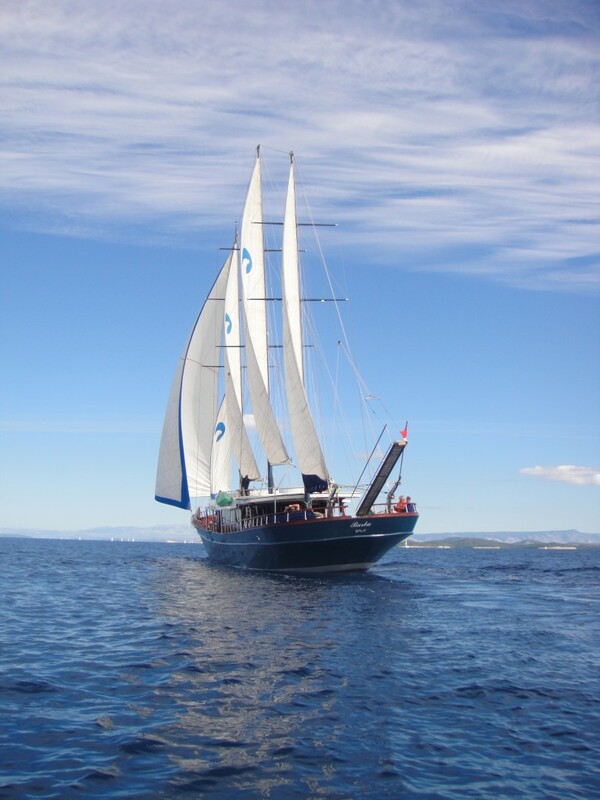 S/Y BARBA’s interior is unimposing, done in subtle tones of blue, white and high quality mahogany wood. 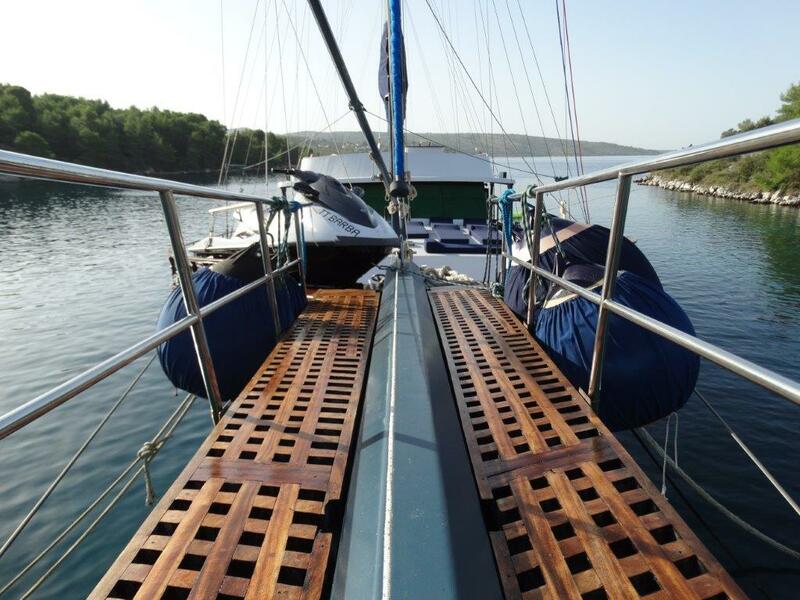 The main upper deck dominates a spacious cabin made out of mahogany wood with warm, honey like color. 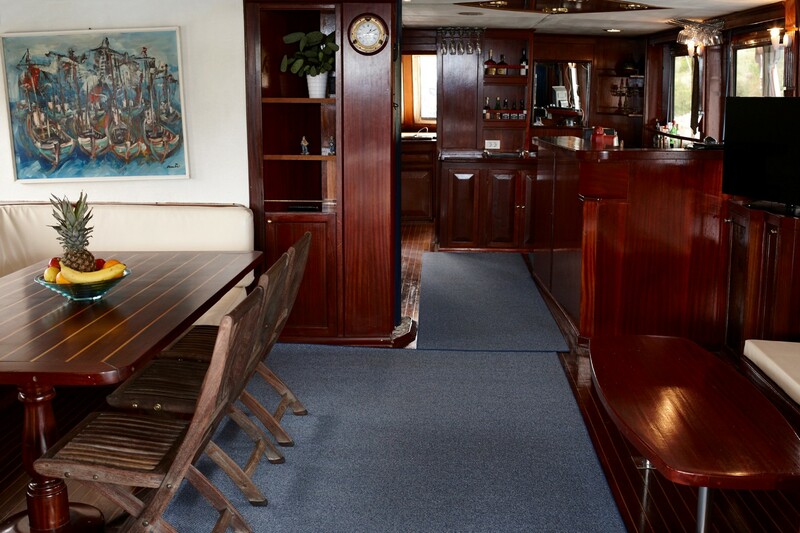 This main saloon interior holds spacious, airy saloon and bar, with large panoramic windows. A fly bridge deck over the saloon provides comfortable shade to the yachts social interior spaces. 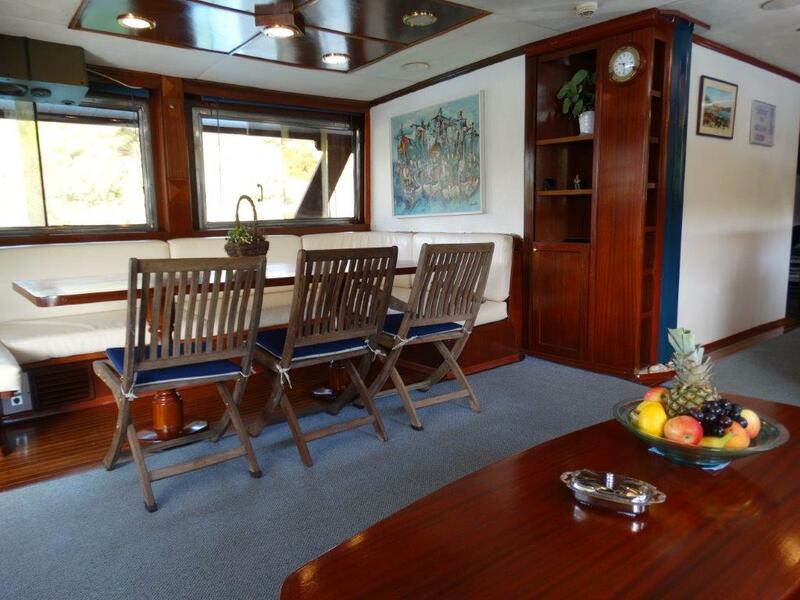 Generous and airy cabins are located on lower deck, boasting a similar harmonious décor as seen throughout the yacht. Each cabin boasts en-suite facilities with comfortable living areas, and a minimum of 3 windows, providing ample natural light. 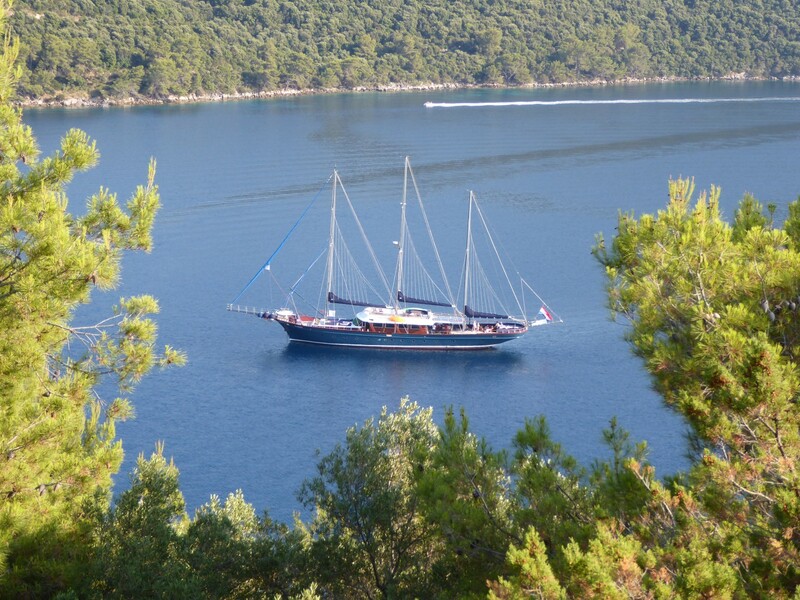 The Gulet Barba’s main features are capacious exterior decks, including her main deck, sun deck and fly bridge deck. 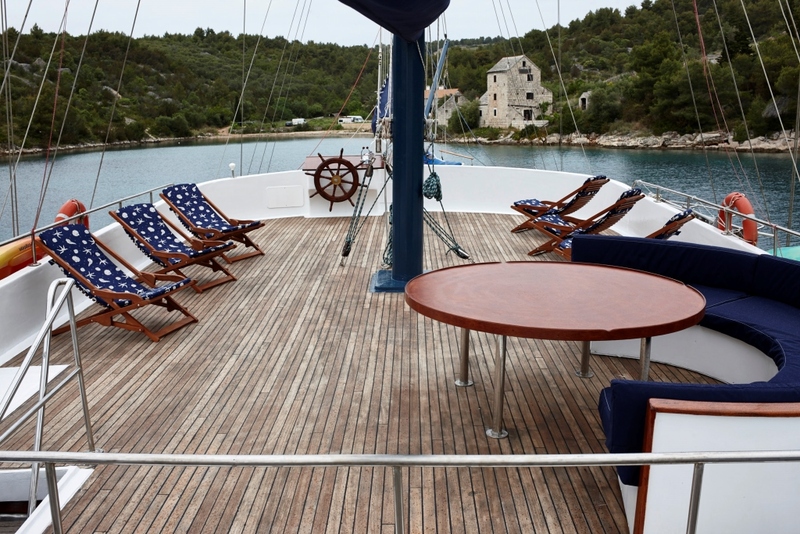 The fly bridge deck is teak, with expansive soft seating areas, circular sofa and an alfresco dining table, all finished with a blue and white theme, stylishly evoking the Mediterranean tones. 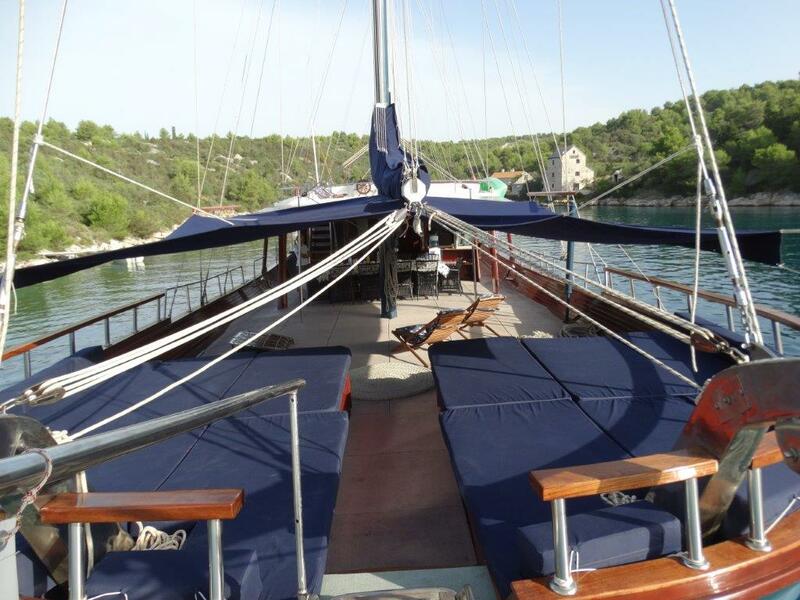 The main deck is the most spacious with sun deck on the bow and shaded stern deck, both furnished with sunpads for twelve guests, allowing all charter guests to soak up the sun simultaneously. 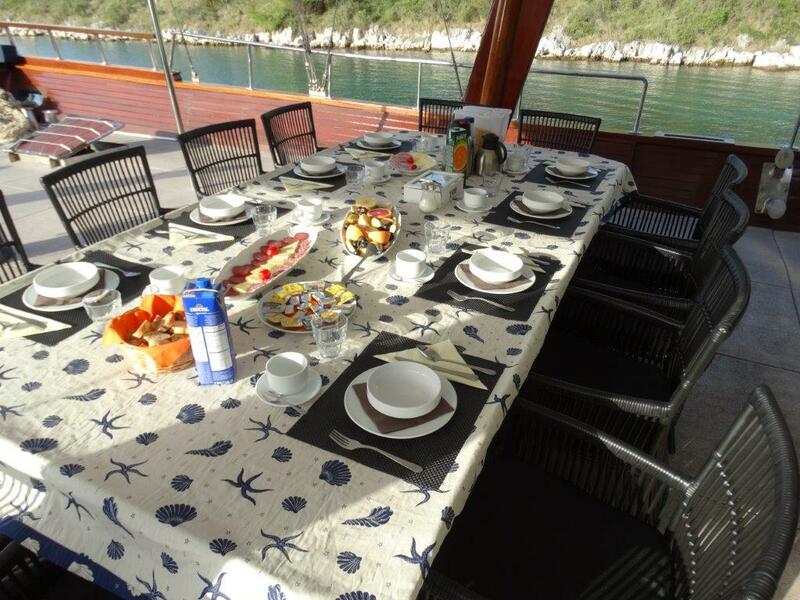 The shaded aft deck is perfect for entertaining, featuring plenty of additional seating and a large alfresco dining table. 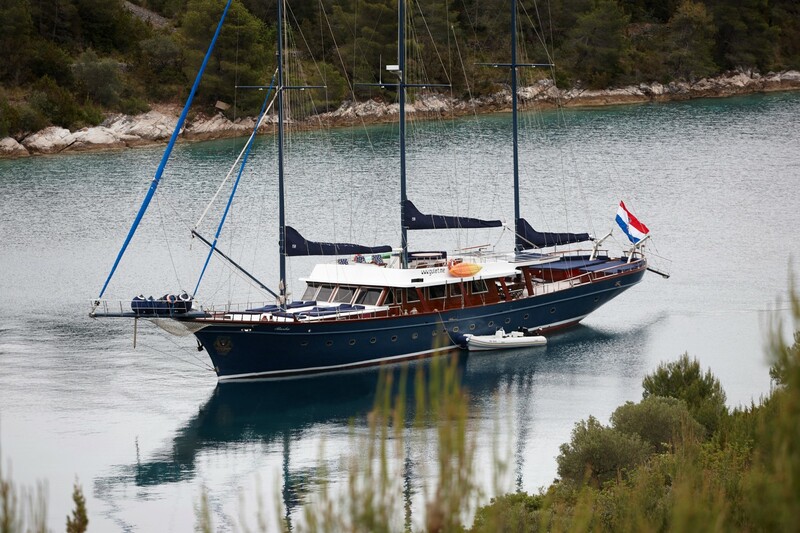 S/Y BARBA is powered by two Caterpillar engines, each with 450 HP offering a cruising speed of 9 knots. 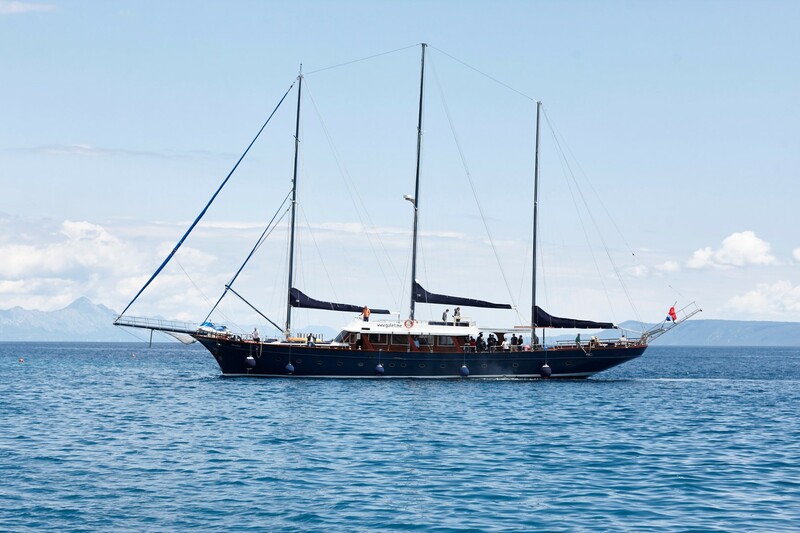 With 3 masts, 2 furling genoas and 3 main sails, BARBA provides a smooth luxury sailing experience. BARBA’s exterior hull and rigging where constructed in steel. 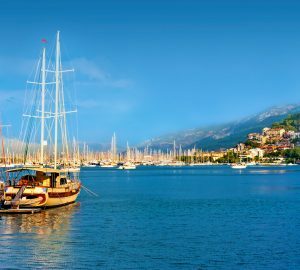 For additional electrical power and environmentally friendly attributes, the yacht boasts modern solar panels. 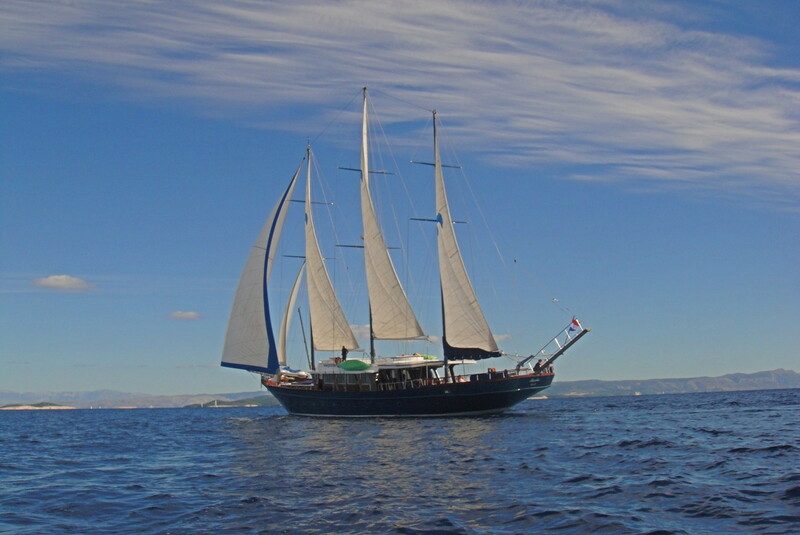 Luxury sailing gulet BARBA accommodates twelve charter guests in six, en-suite cabins. The forward cabins offer one Master cabin, and two twin cabins. 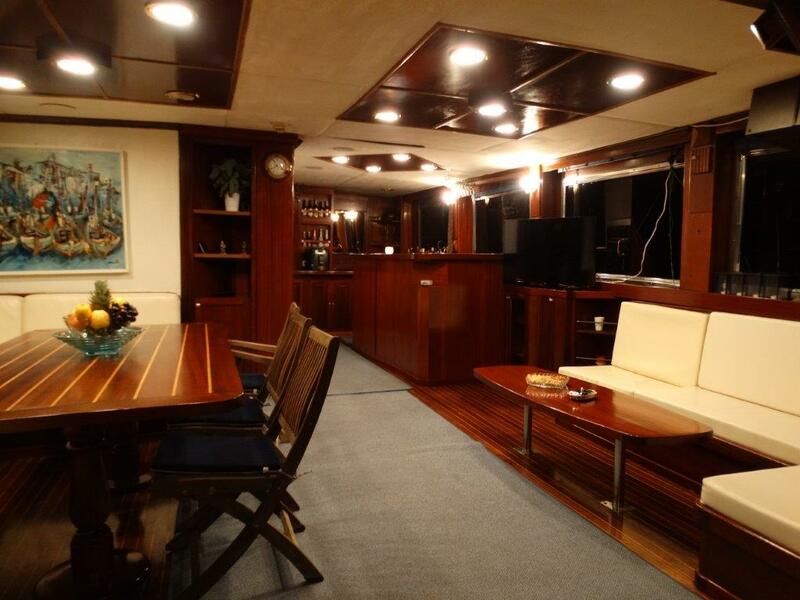 Aft of the yacht are two master and one twin cabin. 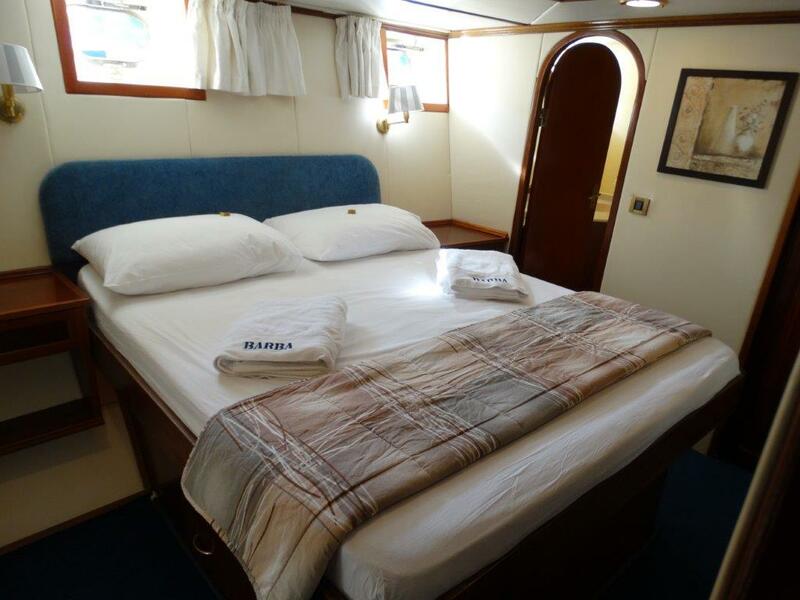 The master cabins have king size beds with bed side table lamps and night stands, and plenty of living space. 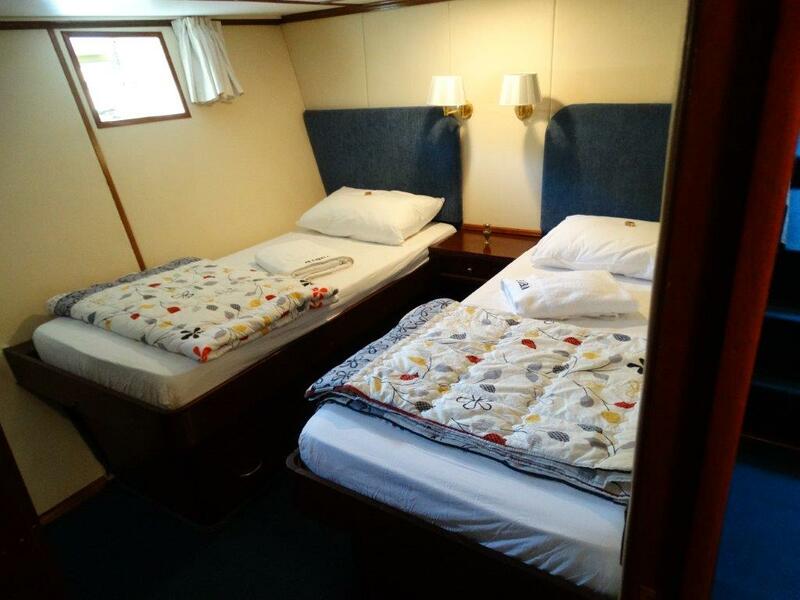 Each twin cabins also have large beds bedside lamps and bed stand. All guest cabins feature a spacious bathroom, wardrobe, shelves, AC plugs and air-conditioning. 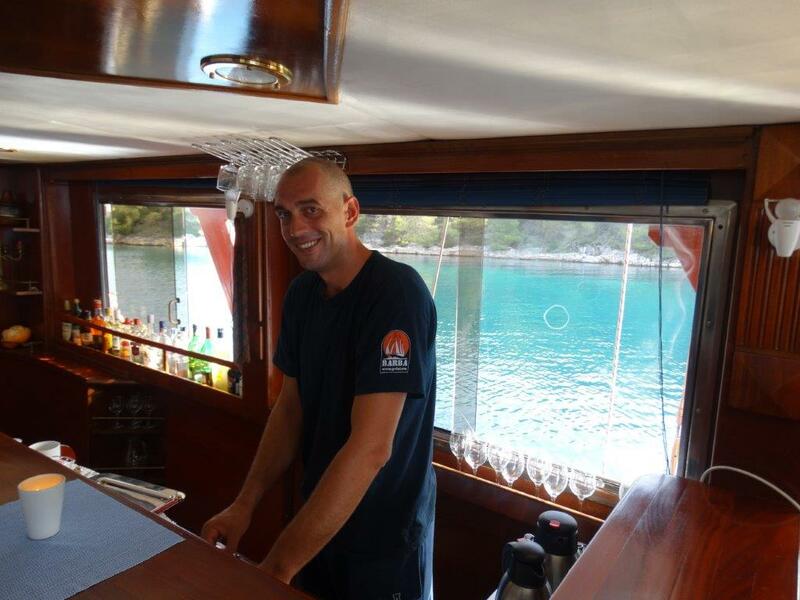 BARBA has fully equipped ships galley, deck shower, deck awning, solar panels for all the comfort on board. 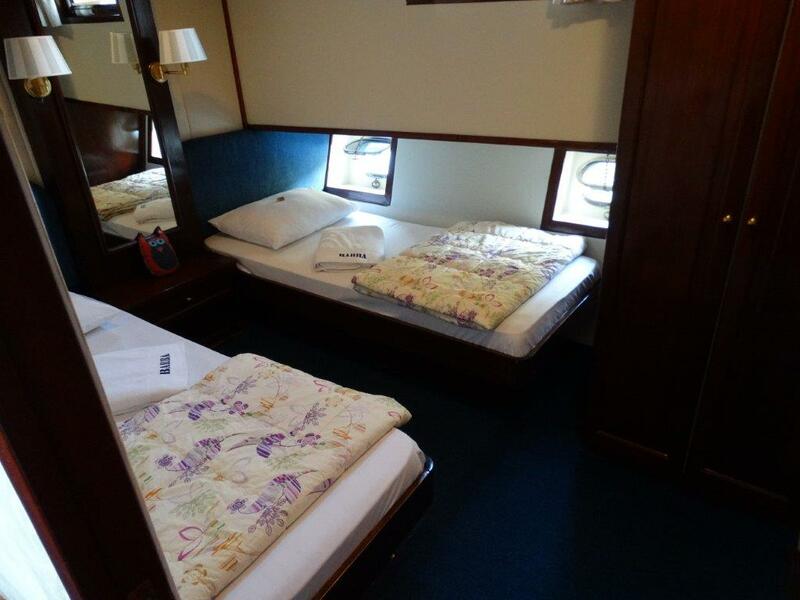 Saloon and cabins are air-conditioned. In saloon there are free flat TV, PC WIFI, DVD, Music system. All the linen, towels, beach towels, toiletries are provided. There are plenty water toys: Jet ski, water ski, donut, canoe, SUP, snorkeling and fishing sets, water matrasses.